Earth is a fascinating place. Environmental Geoscience majors at SRU learn firsthand just how magnificent our planet really is. This major gives you the opportunity to discover and explore the geological and environmental materials and processes that make up our world. You'll apply techniques and concepts from chemistry, mathematics, and the geosciences to understand the historical development of Earth systems. You'll also have opportunities to participate in research and take advantage of internships, career development, and professional networking. 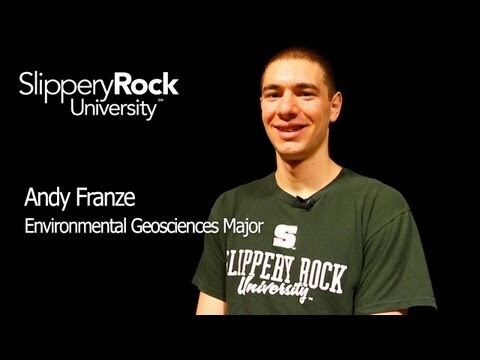 Environmental Geoscience at SRU is an excellent choice for students who want a degree with the flexibility to incorporate a second major-such as Safety Management, Business, Education, or other sciences. If you're interested in learning how Earth systems operate and interact while maintaining flexibility for additional majors or minors, then this program is a great fit for you. Andy Franze is a Environmental Sciences major from McCandless, PA. In this video, Andy talks about his role as president of the Geography, Geology and the Environment club and the opportunities at SRU for students to participate in research and travel.